An easy blueberry cheesecake recipe can be used to create a cold dessert for family dinners, potluck parties, or to serve on a dessert buffet. An easy blueberry cheesecake recipe uses a cream cheese filling, accompanied by blueberries or a blueberry topping and is served in a crust. To make preparation of a homemade blueberry cheesecake easy, one or more portions of a made from scratch recipe may be altered. 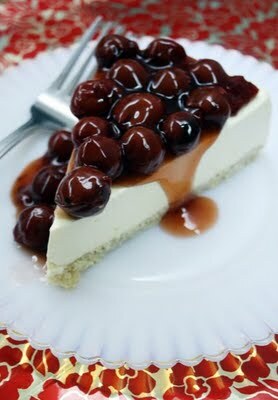 The crust of the cheesecake may be simplified. 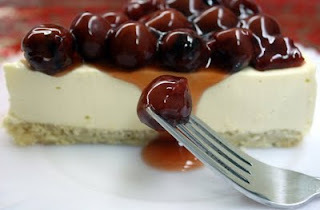 The cream cheese filling may be made completely made from scratch or may be purchased as a premade ready to eat filling.1 The blueberry portion of a blueberry cheese cake may be converted to an easy style by using fruit only with sweetened filling or by using a canned pie filling as the topping. -Combine crumbs, sugar and butter in a small bowl and blend well. Press firmly over the bottom of an 8-inch spring form pan. Chill. - Combine sugar water and cream of tartar in a small saucepan; bring to boiling. Boil rapidly, 8 to 10 minutes, or until syrup registers 236 degrees on a candy thermometer (or until from spoon). - Meanwhile, in large bowl of electric mixer beat egg whites until stiff peaks form. Pour hot syrup in a thin stream over egg whites while beating constantly. Continue beating until very stiff peaks form and mixture cools, all together about 15 minutes. -Beat cream cheese and sour cream until light and fluffy, beat in vanilla and lemon rind. Add 1/4 of meringue to cheese mixture, stir to combine well. - Fold remaining meringue into cheese mixture until no streaks of meringue and cheese remain. Spoon about 1/4 of cheese mixture into prepared pan, drizzle part of blueberry preserves over. 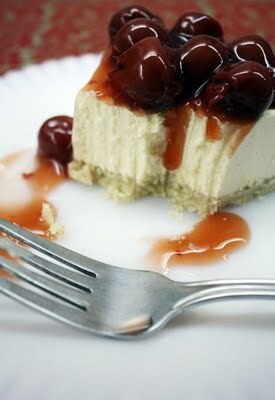 - Continue to layer cheese mixture and preserves this way creating a marbled effect.